Following a presidential campaign season characterized by regular conflicts between Donald Trump and the news media and the continuation of these tensions since President Trump took office, nearly all Americans have taken notice, and large majorities feel these tensions are causing problems. According to a new Pew Research Center survey, 94% of Americans say they have heard about the current state of the relationship between the Trump administration and the news media. 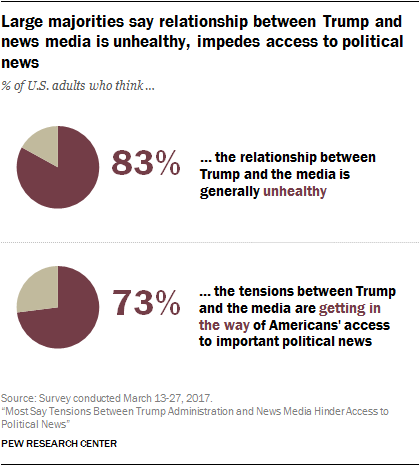 And what they’ve seen does not reassure them: Large majorities feel the relationship is unhealthy and that the ongoing tensions are impeding Americans’ access to important political news. Moreover, both of these concerns are widely shared across nearly all demographic groups, including large majorities of both Democrats and Republicans. These findings come from a survey conducted March 13-27, 2017, among 4,151 adults who are members of Pew Research Center’s nationally representative American Trends Panel. The current tensions between Trump and the news media are, according to most U.S. adults, problematic. About eight-in-ten Americans (83%) say current tensions have made the relationship between the administration and the news media unhealthy; just 15% say it is healthy despite current tensions. Americans also think these tensions are impacting them directly. About three-in-four U.S. adults (73%) say that these tensions are getting in the way of access to important national political news and information. What’s more, these sentiments cut across party lines. Fully 88% of Democrats say the relationship is unhealthy, as do 78% of Republicans. And about seven-in-ten members of both parties say access to important political news is impacted. The findings are similarly consistent across other demographic groups such as age, race, income and education. 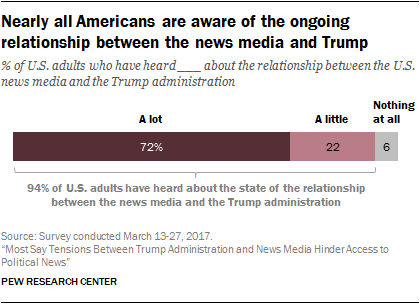 Awareness of the current state of the relationship between the Trump administration and the news media is virtually ubiquitous in America. Nearly all U.S. adults (94%) say they have heard about it, with roughly three-in-four (72%) saying they have heard a lot. Only 6% say they have heard nothing at all. There were some age differences in how much people had heard about the relationship. Younger Americans are somewhat less likely to have heard a lot about the relationship. Fully 55% of adults ages 18-29 say they’ve heard a lot compared with 71% of those 30-49, 77% of those 50-64 and 86% of those 65 and older. Still, 87% of 18- to 29-year-olds had heard at least a little about the issue. This difference is consistent with findings showing that younger Americans tend to be less interested in news overall. The findings do not speak to who Americans blame for these tensions or what Americans want done about the situation. But what is clear is that they currently have high levels of awareness and concern.